Many schools are creating a library of apps to act in much the same way as their library of books. A well-stocked mobile device can be useful in directed lessons but should also contain interesting and enticing material for a child to just engage with because of their own interests. Art Stories CITIES is an app that is ideal for expanding a school's app library into a topic not covered as much as others - that of geography. In some ways, the app is like a picture book. Children can encounter and learn about new buildings and places in cities across the world. Users of the app spin a smoothly rendered globe to find and select the next city to look at. Each is identified by only their flag at this point. Each stylised picture of a city has some blank spaces. Into these, children can drag the appropriate shapes from below to complete the skyline. Each time they do so they hear a clearly recorded fact about the city linked to the item that they have just dragged. The facts are well chosen and vary across history, commerce and art. 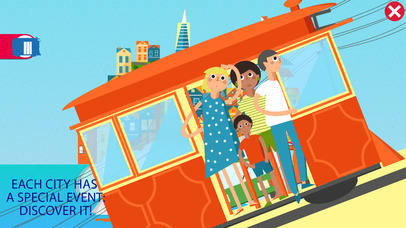 Children won't come away from each scene as an expert in the city but they will know a few interesting facts and be able to recognise the most famous buildings located there. The drag and drop nature of the scenes gives younger children the stimulation and practice of matching shapes as they learn. Older children don't need this practice but they won't feel that it is a mechanic that is too young for them. It just feels like the method of moving on to another fact, almost like turning the page in a book. 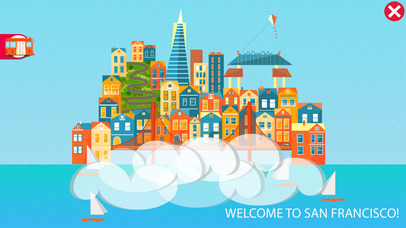 The app's title suggests that the app will be visually interesting and it is.The buildings are stylised in a consistent way, and, while simplified in their look, are clearly recognisable as the building they represent. Little animations liven up each scene. While the app feels like a book, its facts are delivered by the spoken word. On the one hand, this won't give children any reading practice, on the other it lets weaker readers learn without being held back by their literacy levels. 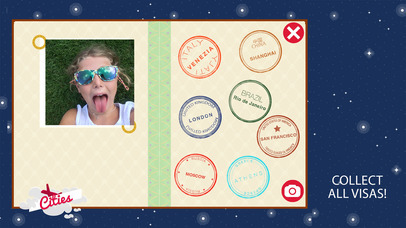 The app tracks children's progress through a passport screen. A pleasant addition is a blank canvas on which children can combine the world's best-known buildings to create their own idea of a great city. The app isn't especially long covering as it does just seven cities. People with a fondness for a certain city may feel disappointed to find it is not one of the ones that are covered but those that are there cover each of the populated continents, except for Africa. Europe gets the lion's share, however. It would be nice if just a few more cities were added in a future update to balance out the coverage of continents. As an attractive and informative app that covers a less-visited subject at primary level, Art Stories CITIES is well worth considering for your school's app library. It will make an excellent addition for children's independent learning or for when a child just wants to browse new and interesting subjects. Fancy to travel worldwide and discover foreign cities? 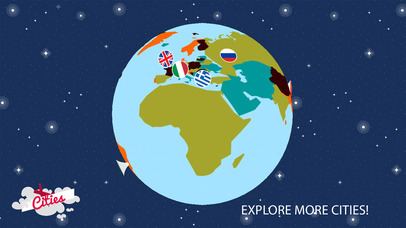 By travelling on the world map, kids discover seven cities in seven different countries: Italy, Great Britain, China, Brazil, USA, Greece, Russia. There is more to come! Having completed the skylines, by picking the buildings and setting them in the right place, children can dive into some typical events: for instance, they visit Venice with high-tide and Rio with the Carnival! The young traveller who has explored all cities is rewarded with a complete passport and with a free to play skyline: get ready to compose your utopian city! 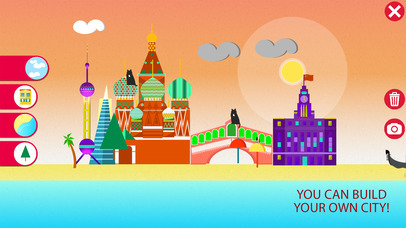 – compose your ideal city, using buildings and elements you have met along your journey. Save it on your camera roll, and use it as a postcard or a journey planner! With the help of parents and teachers, the app can be used either to teach geography or while traveling.